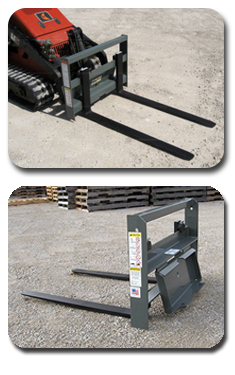 Designed with the contractor in mind, these skid steer pallet forks are rated at 4,000 lbs. capacity. Select models offer a step through design for easy access into / out of the cab. Standard pallet fork models feature non-step through single piece back stop. Excellent see through visibility allows the operator to see the material being picked up. These SitePro attachments feature easy loading with durable, tapered fork construction for long service life plus adjustable fork spacing provides better load stability. Back guard is standard equipment on all skid steer pallet fork models. Clamp-on pallet forks are also available as an easy, economical way to quickly move palletized materials. These pallet fork attachments mount to most skid steer buckets without the use of tools. To support the load, forks extend 14.5" under the bucket, 8" inside the bucket. Features easy on/easy off "T" handle design which saves time when clamping and unclamping forks. View our literature. Perfectly matched to Mini Skid Steer / Compact Tool Carriers these pallet forks elevate the professional’s productivity. Two models are offered for job matched performance. Model MPF-1200 (rail style) features forks that are 1" x 3" x 36" Class I tines mounted to an all welded frame, rated capacity is 1200 lbs. Model MPF-2000 (rail style) utilizes Class I tines, 1.18" x 3" x 42" mounted on a frame that is 33.25" wide with a rated capacity of 2,000 lbs. Both models incorporate the universal mini mount to match to most machines (Fits mini skid steers: Toro Dingo, Boxer, Ditch Witch, Vermeer, Thomas, Ram Rod, Finn. Note: Will not fit Bobcat, Kanga Kid, Gehl, Prodigy). Offers solid fork positioning with spring-loaded, toggle operated latches. • Pallet forks provide versatility for your Skid Steer. • Optional interfacing quick-attach brackets are available and work with most popular loader models.